Here’s a great gift item produced by one of our Forum Members. Tom Sziler (aka Tomekeuro85) makes CNC-machined aluminum coasters designed to look like cartridge headstamps. 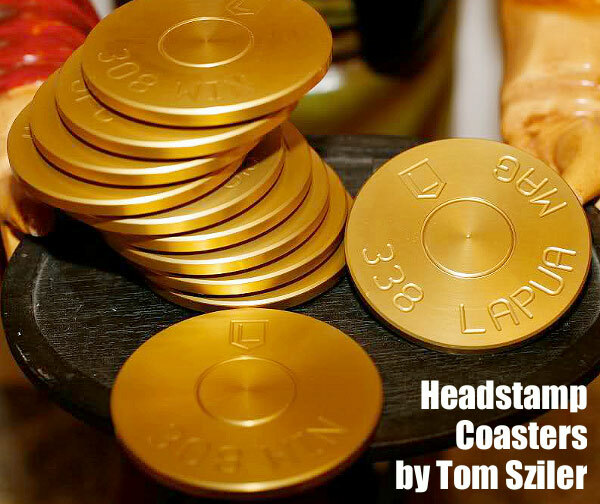 Tom’s coasters are first milled from a solid piece of 6061 aluminum, then anodized in a brass color. Anodizing provides color and protects the finish. Headstamp Coasters come in sets of four (either matching or mixed) with rubber pads on the bottom. Tom can engrave his coasters to look like most actual production headstamps, for almost every cartridge. (Buyers need to specify the Cartridge name and brass manufacturer.) Cost is $35.00 for set of four (4) matching coasters, or $40.00 for a mixed set with various calibers or mfg. names. Shipping is $5.00 flat rate. Discounts are offered with five (5) or more sets. Order from Tom.Sziler [at] gmail.com. Tom is taking orders now for Christmas delivery. He told us: “I will set a limit of 60 sets so that I can have them all shipped out in time for Christmas. If you’re interested please get your order in ASAP. I would very strongly prefer to have payment by November 25th at the latest to have everything ready to go as soon as I can. If the payment is not received by that date, I cannot guarantee delivery by Christmas.” To order, send email to Tom.Sziler [at] gmail.com . 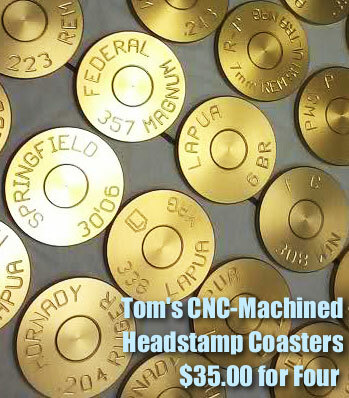 Share the post "CNC-Machined Headstamp Coasters — Great Gift Item"
Is he still around? Website is down and no reply to email.